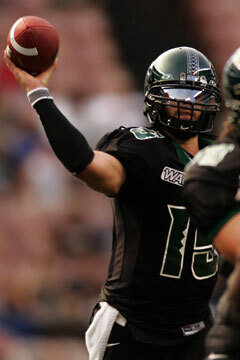 Hawaii quarterback Colt Brennan is among the NCAA leaders in most passing statistics. EVERYONE knows Hawaii has two former NFL head coaches on its staff in June Jones and Jerry Glanville. But were you aware that three Eastern Illinois alumni are current NFL head coaches? They are Mike Shanahan (Broncos), Sean Payton (Saints) and Brad Childress (Vikings). When Eastern Illinois has the ball: The Panthers have quite a few players with Division I-A talent, the most obvious being receiver Micah Rucker, a 6-foot-6, 230-pound matchup nightmare. He's a transfer from Minnesota, and he's caught 16 passes for 395 yards and six touchdowns in four games. Vincent Webb is another big weapon with 139.5 rushing yards per game, ranking him third in Division I-AA. He went for 208 in last week's win over Samford. "Vincent's having an outstanding year for us. He's our team captain, a two-time 1,000-yard rusher and he's had an exceptional first four games," EIU acting coach Mark Hutson said. The Warriors will try to stop him with new starters at one or both outside linebacker spots; Karl Noa replaces Tyson Kafentzis (out with a fractured ankle) and Brashton Satele is being considered on the other side to take over for C.J. Allen-Jones, who started the first three games. Solomon Elimimian (knee sprain) looks ready to resume his inside linebacker activities. UH returns C.J. Hawthorne to a starting spot in place of A.J. Martinez in a seemingly endless quest to find the best two corners. Kenny Patton, with a big interception last week, is safe for now on the other side. "We're alternating them until someone stands out as clearly better than the others," defensive backs coach Rich Miano said. When Hawaii has the ball: The ankle sprain to slotback Ryan Grice-Mullins caused a shuffle that will probably have Ian Sample starting at wideout replacing Ross Dickerson, who will either start in Grice-Mullins' spot or play a lot there in rotation with Aaron Bain. True freshman Malcolm Lane may also get some plays on the outside. "I think he can play. He can go," UH receivers coach Ron Lee said of Lane. Quarterback Colt Brennan is again among the nation's leaders in most passing stats, and he's No. 1 in points responsible for with 21.33 per game. He and left tackle Tala Esera will be especially aware of EIU defensive end Pierre Walters, who has four sacks among his eight tackles for loss. "I expect zone, a lot of zone blitzing," Brennan said. "I expect them to bring some pressure, and they do have good athletes. They have some fast kids, some kids who can fly around and some kids who can give us some problems. It's another week, another defense and us making the adjustments." If the Panthers come too hard, Brennan will flip shovel passes and screens to Nate Ilaoa. In addition to being UH's leading rusher, he has 12 catches for 177 yards. Special teams: Jones is right when he says Hawaii actually outplayed Boise State in special teams last week except for three bad snaps by the Warriors. The problem is the miscues on two point-after attempts and a field-goal try had a direct effect on the scoreboard of a close game. Third-string quarterback Inoke Funaki replaces punter Kurt Milne as the holder this week. On the positive side, Dan Kelly has made every kick he's gotten his foot on: all 10 PATs and a 42-yard field goal. Also, UH's return and coverage teams are significantly improved from last fall. Myron Newberry has displayed sure hands and happy feet on punt returns, and Dickerson nearly broke a kickoff return for a TD after dropping the ball. Panthers kicker Zach Yates has made at least one field goal in nine straight games. Eastern Illinois' best hopes for an upset depend on controlling the ball and the clock. This would decrease the number of possessions for both teams, and give the Panthers a better chance of not letting the score get away from them. To do this, Webb must consistently grind out yardage -- something Boise State was able to do against the Warriors, but both Alabama and UNLV could not. On a typical zone play, EIU's linemen go to assigned areas to lead the interference and Webb reads how the defense reacts to his blockers' movements. If the defense does not respond quickly, his blockers outnumber them at the point of attack, and Webb can get a big gain by simply following them. If too many defenders follow the blockers, Webb cuts back against the grain and turns the defense's quick pursuit into costly over-pursuit. "What Webb does better than most backs is he makes his cut up in the line of scrimmage (rather than earlier, behind the line)," UH defensive line coach Jeff Reinebold said. "That makes it more difficult and makes you have to play very disciplined." Y 85 Aaron Bain 5-9 183 So. or 82 Ross Dickerson 5-10 198 Sr.
STUB 12 Karl Noa 6-4 238 Jr.
or 43 Brad Kalilimoku 5-10 213 Jr.
WILL 33 C.J. Allen-Jones 6-1 224 So. or 13 Brashton Satele 6-2 243 Fr. CB 24 Kenny Patton 6-0 188 Sr.
SS 31 Jacob Patek 6-0 202 Jr.
CB 19 C.J. Hawthorne 5-11 161 Jr.
KR 24 Kenny Patton 6-0 188 Sr. Snap 57 Jake Ingram 6-4 268 So. WR 9 Ryan Voss 6-5 194 Sr.
LG 63 Drew Cairo-Gross 6-1 315 Jr.
C 65 Steve Sobolewski 6-4 287 Sr.
RG 77 Jon Reuter 6-5 281 Sr.
RT 73 Anthony Rubican 6-5 300 Jr.
TE 86 Adam Parsill 6-4 250 Sr.
WR 80 MIcah Rucker 6-6 230 Jr.
FL 3 Jermaine Mobley 6-0 189 Sr.
QB 10 Mike Donato 6-1 192 Jr.
RB 29 Vincent Webb 5-10 206 Sr. LE 55 Michael Torres 6-0 243 Jr.
LT 90 Tim Kelly 6-4 270 Jr.
RT 97 Jeff Sobol 6-3 260 So. RE 91 Pierre Walters 6-5 252 So. SAM 6 Lucius Seymour 5-10 210 Sr.
MLB 54 Donald Thomas 5-10 228 Jr.
WILL 47 Matt Westrick 6-0 240 Jr.
CB 2 Ben Brown 6-0 185 Sr.
ROV 1 Tristan Burge 6-0 214 Sr.
FS 26 Seymour Loftman 5-11 191 So. CB 7 B.J. Brown 5-11 170 Sr.
PK 27 Zach Yates 5-11 175 So. P 27 Zach Yates 5-11 175 So. Snap 86 Adam Parsill 6-4 250 Sr.
KR 15 Quinten Ponius 5-9 198 So. 19 Adam Kesler 5-9 178 So. PR 19 Adam Kesler 5-9 178 So. 5 Charles Owens 5-10 178 Sr. Hold 11 Justin Duhai 6-1 197 Sr.